Justice Bhagwati passed away on 15th June 2017 at the ripe age of 96. Judges get elevated to the Supreme Court and in due course they retire, but a few remain permanently etched in our memory. Justice Bhagwati would be long remembered for his contribution to the development of law for the purpose of advancing the cause of justice. His Lordship imparted to dry letters of law a touch of humanism. He took judicial activism in the right direction. Even those who were apprehensive about the judicial activism cannot say that the judgments of Justice Bhagwati create a judge made law. His Lordship’s greatness lies in utilizing principles contained in directive principles of the state policy while enforcing fundamental rights. The classical example of this is the judgment in Mukti Morcha case popularly known as Bonded Labour Case (1984) 3 SCC 161. This judgment put an end to the pernicious practice of bonded labour. This system of bonded labour required poor people to provide labour to their master for years and years until alleged debt owed by the labour to the master is wiped out. Such an event never used to take place in the lifetime of the bonded labour. In liberating the bonded labour from the clutches of such unscrupulous masters and enforcing the Minimum Wages Act his lordship based judgment on fundamental rights contained in Articles 21 and 23 of the Constitution. This judgment ushered in a new era of revolutionary jurisprudence based on eternal values of social justice. The right to live with dignity and free from exploitation is the core of the right to liberty contained in Article 21. In all His Lordship’s judgments we find an anxiety to devise new tools to deal with the changing needs of the society. His Lordship’s contribution to the development of the Indian jurisprudence is un-paralled. It is not possible for me to refer to all the judgments, which gave a new dimension to the Indian legal system, but I would be failing in my duty if I do not refer to some other path breaking judgments of this His Lordship. In the case of Ramanna Shetty v. International Airport Authority 1979 (3) SCR, 1014, His Lordship recognized that every action of the State even in the matter of distribution of State largesse must be informed by reason and must be tested on the touchstone of Article 14 which embodied the eternal principles of fairness. This judgment clearly gives a new dimension and meaning to the provisions of Article 14 i.e. right to equality. In the case of Ajay Hasia v. Khalid Mujeeb, 1981 (2) SCR 79 His Lordship displayed in crystal clear terms the concern for enlarging the amplitude of fundamental rights. The society in question was a society registered under the Societies Registration Act, but the Central Government had control over the functioning and working of the said society. The Court held that though society has a juristic personality of its own it is still an instrumentality and an agency of the State and therefore subject to the discipline of the fundamental rights. In the case of M.C. Mehta v. Union of India, 1987 (1) SCR 819 shows his Lordship’s concern for justice for the common man. In this case oleum gas leaked from a factory of a private company, the affected citizens filed a petition under Article 32 for seeking compensation and for shifting the factory from its premises in Delhi. His Lordship’s judgment recognizes that seeking compensation even against a private company in case it handles dangerous matters can be a subject matter of a public law. A tortious liability can be enforced even in a writ petition under Article 32 of the constitution. Apart from his lordship’s contribution to forging and devising new tools for social justice, in some of his judgments we find profundity of his wisdom. For e.g. Minerva Mills Limited v. Union of India, 1980 (3) SCC 625, judgment. This judgment goes a long way in preserving and protecting the basic structure of the constitution. His Lordship held that any amendment to the constitution, which seeks to enlarge the power of the parliament to amend the constitution and thereby freeing it from the limitations of basic structure of the constitution, is ultra vires the powers of the parliament. 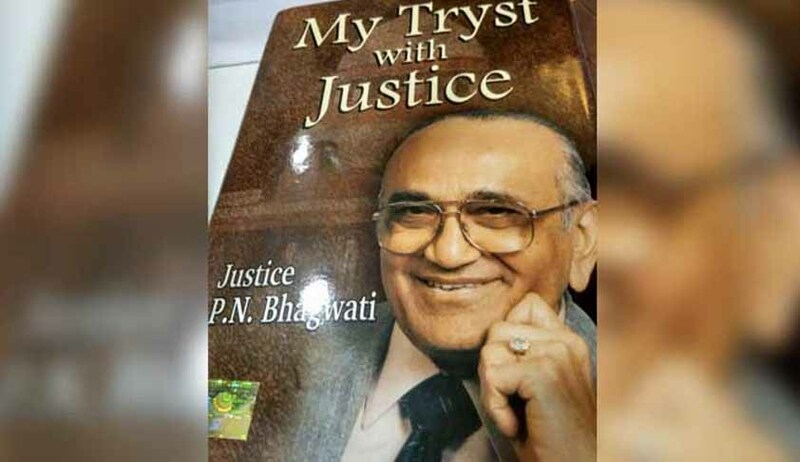 The legal fraternity and the common man and even the country as a whole owes a lot to justice Bhagwati despite a few aberrations in some of his judgments. In evolving new principles of law and developing indigenous jurisprudence, his lordship profusely took inspiration from thinking of great jurists from all over the world. Although he studied the thoughts of all great jurists he had his own mind and precisely knew what is required to be done in Indian context. This is an humble tribute to a great departed soul. Shekhar Naphade is a Senior Advocate in Supreme Court of India.